Jolt Cola: A retro soda that tastes like cola and kicks like an energy drink! Not surprisingly, the go-go ‘80s knew a thing or two about how to keep you revved up. 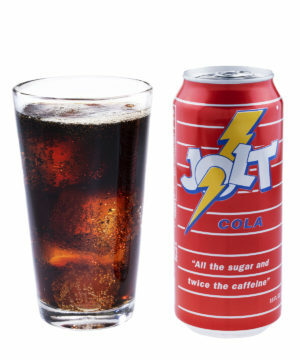 Jolt Cola is a throwback drink that packs more caffeine and sugar than a can of Red Bull to keep you energized longer. In addition to its charmingly retro can, Jolt sets itself apart from other energy drinks by not tasting like an energy drink. With a flavor similar to Coca-Cola, you’ll enjoy this smooth-drinking cola for more than just the prodigious 160 mg of caffeine in each can. Whether you need it for an all-nighter, an early morning, or an early morning after an all-nighter, Jolt Cola is the most tubular way to get the energy boost you need. "All the sugar and twice the caffeine!"